During the 1940s, double breasted suits were the style King. Most well dressed men favored the debonair look that a double breasted suit provided. The way that the jacket wraps around the front just says 1940s like nothing else when it comes to mens fashion and the retro look really makes it happen. 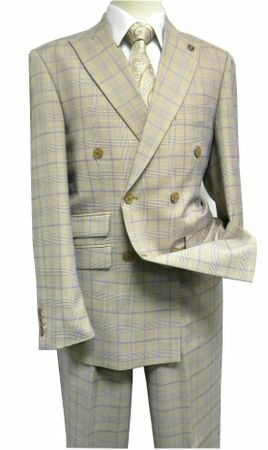 If you like gangster style double breasted suits from the 1940s, you'll love this summer color beige and blue plaid double breasted suit by Stacy Adams. Featuring an intimidating 6 button double breasted jacket with lapels to match and side vents, this suit has what it takes to let everyone else step aside when you walk by. If you are a fan of suits with no pleat flat front style pants, that will be another bonus that you will receive when you get this sharp looking suit. Made of super 150s poly/rayon.